Diagram of IceCube layout. Click for larger version. The Liverpool Telescope contributed to the multiwavelength follow-up campaign of the blazar TXS 0506+056, published last month in Science (IceCube Collaboration, Science, 2018, 361, 1378: arXiv:1807.08816). The campaign was prompted by the detection on 22 September 2017 of a neutrino with an energy of ~290 tera electron volts, by the IceCube Neutrino Observatory at the South Pole. 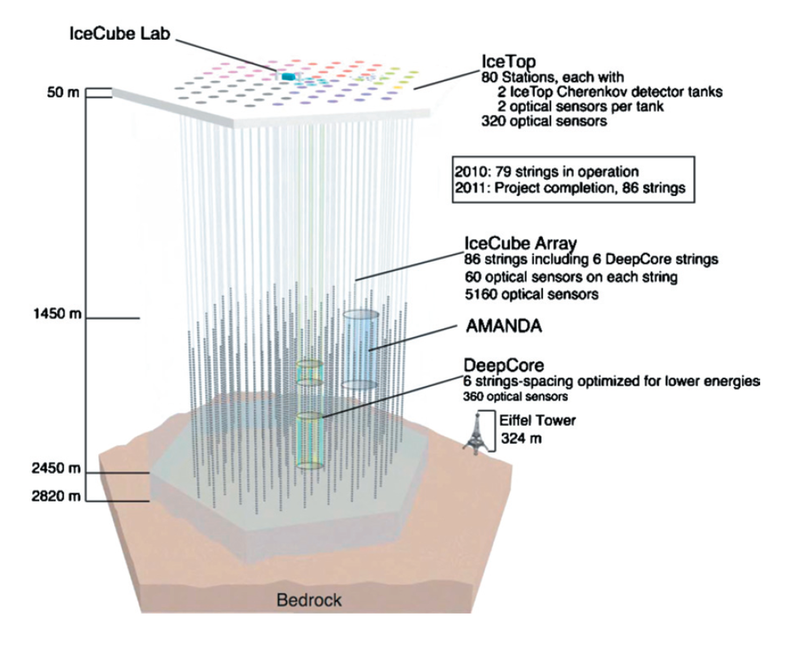 The observatory consists of thousands of sensors buried in a cubic kilometre of Antarctic ice, designed to detect the Cherenkov radiation from charged particles. The neutrino detection was consistent with the gamma-ray blazar TXS 0506+056, which was observed to be in a flaring state at the time. The extensive campaign which followed involved observations from across the electromagnetic spectrum, with the Liverpool Telescope contributing early spectra of the galaxy obtained with its SPRAT classification spectrograph. The observation of a neutrino in spatial coincidence with a gamma-ray–emitting blazar during an active phase suggests that blazars are a source of high-energy neutrinos, and moreover this event marks the beginning of the era of neutrino astronomy, a 'multimessenger' method combining both electromagnetic and non-electromagnetic means of observation. Previous detections of individual astrophysical sources of neutrinos are limited to the Sun and the famous supernova 1987A: the era of neutrino astronomy will hopefully reveal the sources of high energy cosmic rays in the Universe, since neutrinos, gamma-rays and cosmic rays should all be produced by the same physical processes.